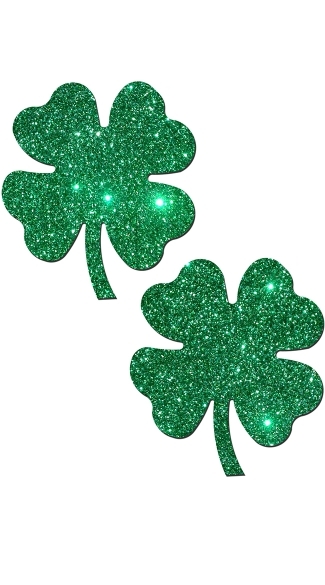 Rock these green glitter shamrock pasties for any Irish themed event, and especially at St. Patty's day parties! Hand-made in the USA, these no-mess glitter nip covers are made of pleather material that curves to your breast form and is wrinkle resistant. Just peel and stick on clean dry skin. It's that easy to use!These pasties are latex-free, medical-grade, waterproof adhesive that stay securely in place for as long as you like and until they are gently removed. Coverage diameter is approximately 1.25 inches.